Our attention has been drawn to the Press Release by the APC dated June 23, 2015 with the above caption. 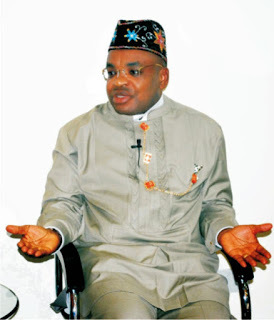 Let me on behalf of the 5 million people of Akwa Ibom State thank the All Progressives Congress (APC) for finally agreeing that elections did take place in Akwa Ibom State on April 11, and that Udom Emmanuel of the PDP was massively and overwhelmingly voted into office as the Governor of our dear State. With this acknowledgement, I hope the APC can now join hands to build our State and support the people-centric programmes of the Udom Emmanuel administration. Shortly after Governor Emmanuel was sworn-in, he hit the ground running and to show a total dedication to his main campaign promise of rapid industrialization, he has already set up a technical committee for the realization of the Ibom Deep Seaport, made up of thorough-bred professionals, with the deadline for the completion put at 2018. He has also visited the moribund Peacock Paint factory at Ikot Ekan, Etinan Local Government Area and will soon constitute a team of experts to advise the government on the revitalization of the industry. Technical committees on Foreign Direct Investment (FDI) and Agriculture and Food Sufficiency will soon be constituted. Also, electricity supply has become more stable since the Governor’s direct intervention with the Port Harcourt Electricity Distribution Company. In two weeks, an additional 20 wattage would be added to the system, which would further stabilize power supply. It appears the APC is more interested in manufacturing issues, most of which defy logical analysis. Governor Udom Emmanuel, in accordance with the law and the requirement by the Code of Conduct Bureau has already declared his assets and the forms duly retuned. APC should thus stop chasing shadows. Akwa Ibom State is under the able hands of an internationally recognized and celebrated technocrat and banker extra-ordinaire, and Governor Udom Emmanuel is deploying his vast contacts and language of communications within the financial world to draw investors to the state. APC should be worried over the deplorable conditions of the citizens in States the party controls such as Osun, where workers have been owed salaries for months and the condition of living is dire, instead of manufacturing lies in an otherwise peaceful and tranquil State like Akwa Ibom State, where Governor Udom Emmanuel stays awake late into the night working on areas to surpass superior performance, and bring home the beacon.